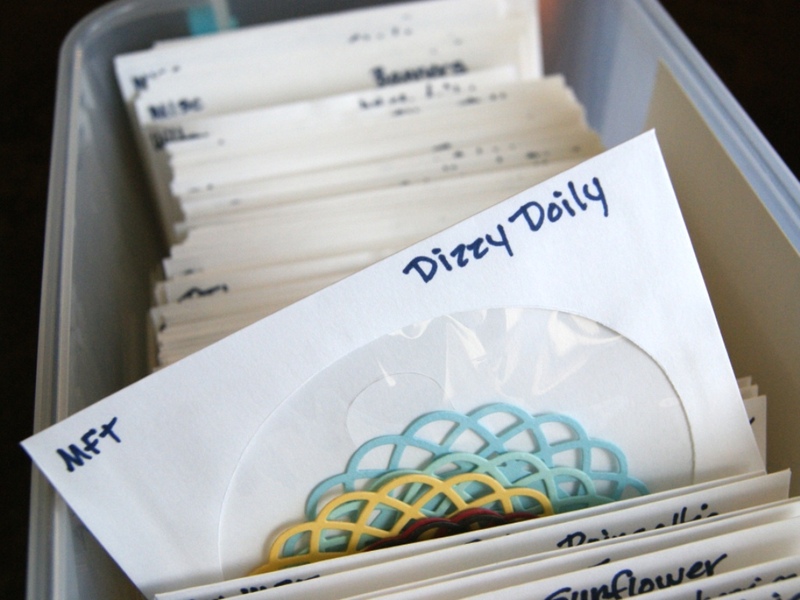 Squeezing creativity into a homeschool life, whenever five minutes becomes available. 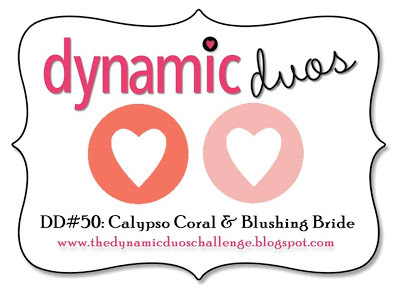 Dynamic Duos #50 – Happy Birthday Vicki! Here today with my last post as a Dynamic Duos Design Team member. **sniffles** It really has been a fun 6 months for me, being on this team – my first official design team. I truly am going to miss it. I want to thank all of you who stopped in to my blog from Dynamic Duos, to be inspired and to leave comments – I appreciate you! Now let’s get on to today’s challenge! 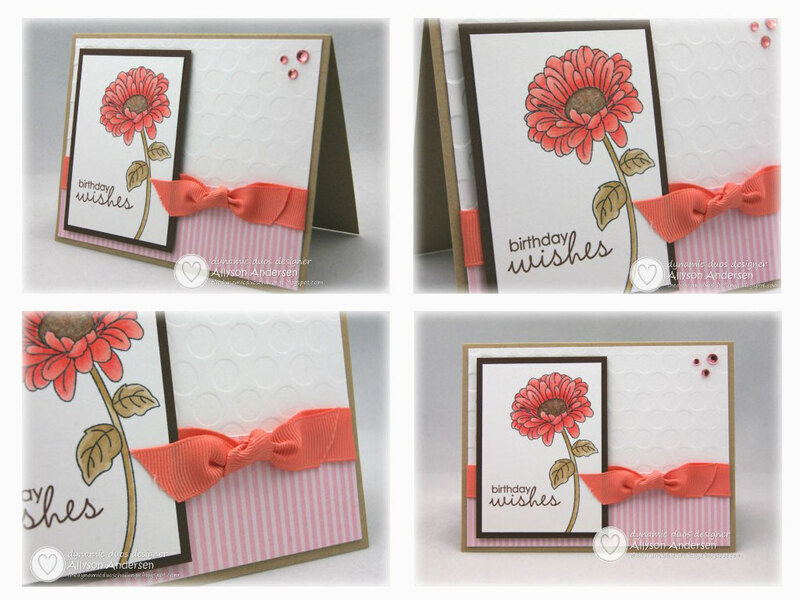 Which is for the lovely combination of Calypso Coral and Blushing Bride. 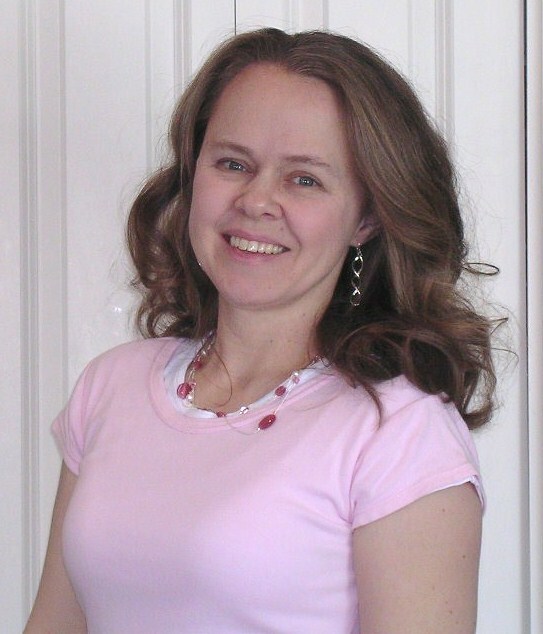 And actually, we have a bit of a surprise for our fellow team member, Vicki Burdick, whose birthday is this week. We all wanted to wish her a Happy Birthday, so we’re using today’s challenge as a way to surprise her with birthday wishes from all of us. 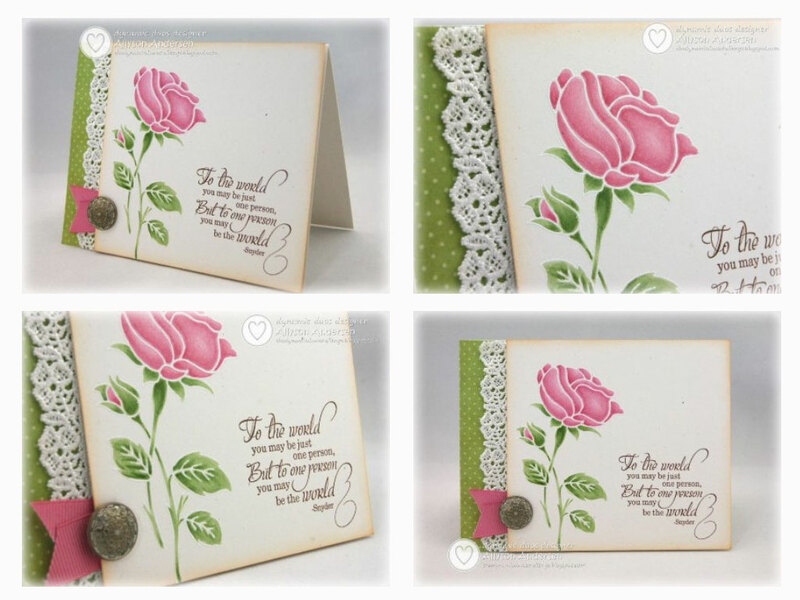 We are also linking our cards over at Lesley’s blog, where a blog hop is being held in honor of the occasion. Make sure you stop in to see what the rest of the Design Team have created and to check out the details for this challenge. And I hope you will participate with us! 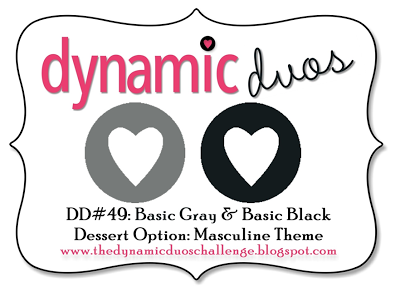 It’s Black Tie week at Dynamic Duos, featuring Basic Gray and Basic Black, with a Dessert Option for a Masculine Theme. 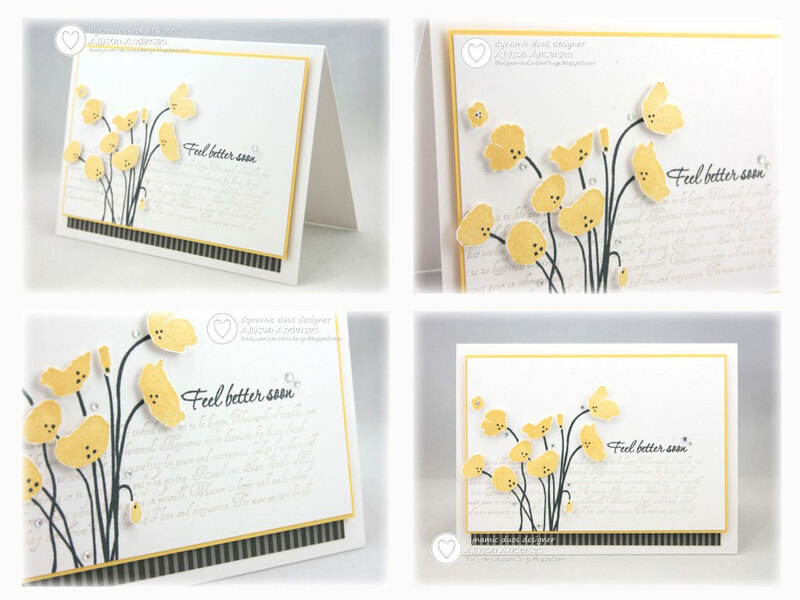 I went with the masculine theme option, but I also plan to use this card design for the young women in our extended families who are graduating this year, with maybe a few minor adjustments to color and detail. 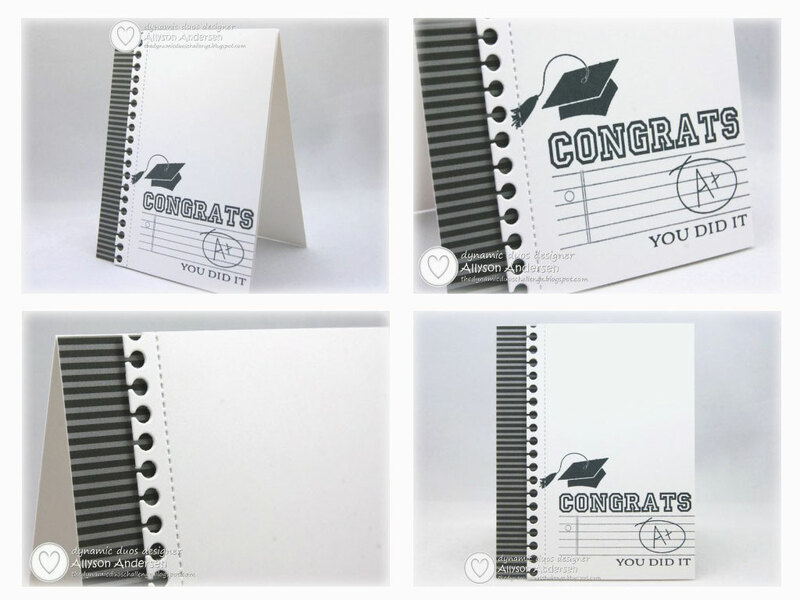 This card features my neglected MFT Notebook Edge Border Die on the left, as well as sentiments from 3 pertinent PTI stamp sets – Congrats All Ways, For The Graduate, and It’s Official. A little section of striped DP on the side and this card is ready to go. Make sure you stop in to see what the rest of the Design Team have created and to check out the details for this challenge. I hope you’ll participate with us! 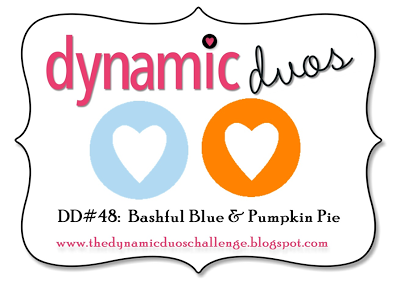 Today’s Dynamic Duos challenge is for the colors Bashful Blue and Pumpkin Pie. Not a combo I would normally choose, as you know! So I immediately went all fetal position with my usual response to situations like this – minimize that stinkin’ color as much as humanly possible. LOL! I bought this cute little Hero Arts rubber stamp at Michael’s a month or so ago, and I thought it might be a fun element to use for these colors. I colored it with my Copic markers, added a few touches of glitter pen to the orange spots for a little sparkle, and then fussy cut it to adhere it with foam adhesive. My blue is a bit darker than Bashful Blue is, but I tried to pick from my limited supply of Copic markers those that were relatively close. Since I am COMPLETELY DAFT when it comes to orange, I just played it safe and used an all-white card to highlight the image in the center of a negative-die-cut opening. 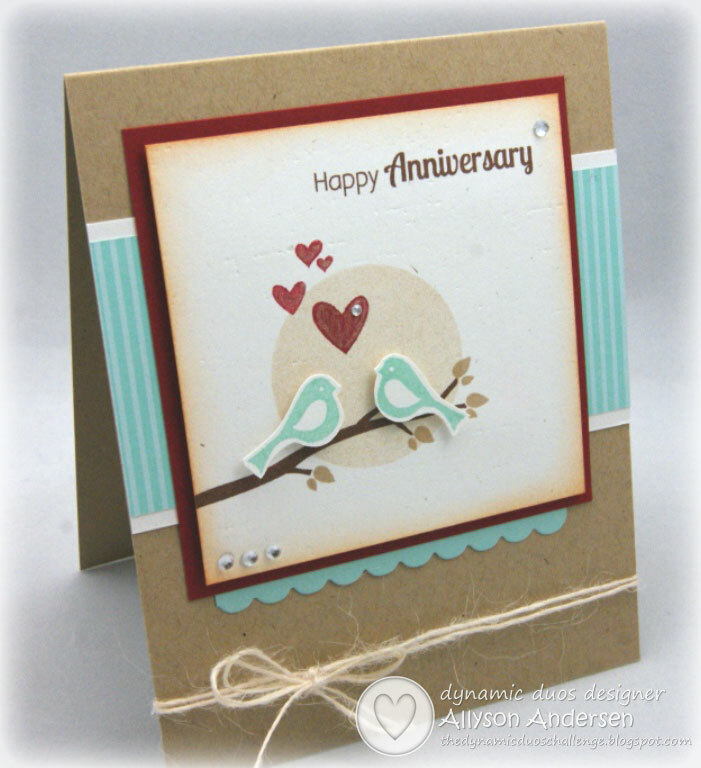 I used Tuxedo Black ink for the sentiment, stamping off once to lighten it up just a smidgen. I’m so sorry not to be more spectacular with these colors (as if I ever AM spectacular! haha), but it’s tough to get a decent card out of me with orange, let alone a spectacular card with orange! 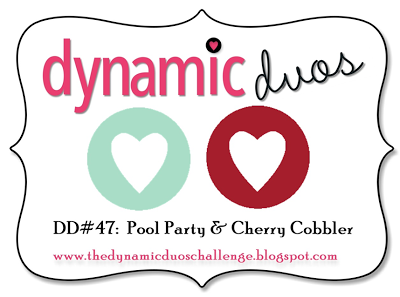 Today’s Dynamic Duos challenge is for the colors Pool Party and Cherry Cobbler. I used PTI Classic Kraft ink for the moon, stamping it off once for the lighter shade. The little leaves are also stamped in Classic Kraft. 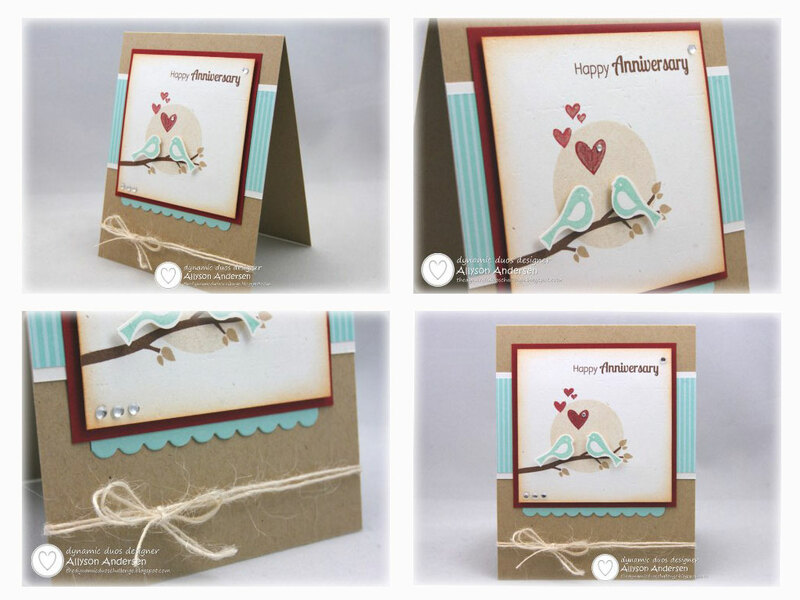 I used the two-heart stamp from the Paired Up set and also two other separate hearts from the Tag Its #11 stamp set to create the group of hearts. I stamped the birds in Pool Party ink and then fussy cut them to adhere them with foam adhesive. This is a 5-week month for Dynamic Duos, which means today’s challenge is Mix-and-Match, where we provide one color and you chose the other color to form your own custom pair. Old Olive was my color of choice for this card, though I used close substitutes for these colors since I was using my Copic markers to color in a stamped and embossed image. 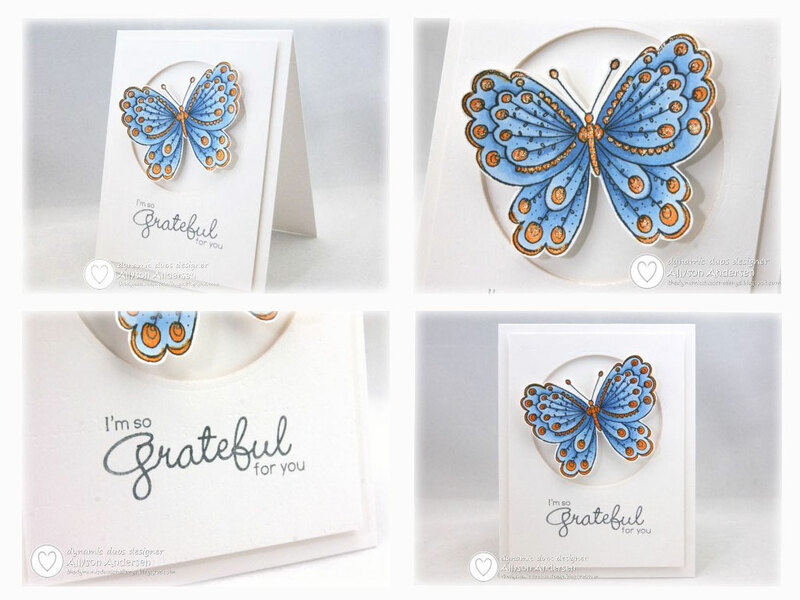 I’ve seen this technique done by Debby Hughes a few times – embossing in white and using pencils or markers to color in the image areas, giving it this lovely appearance – and I absolutely LOVE it! 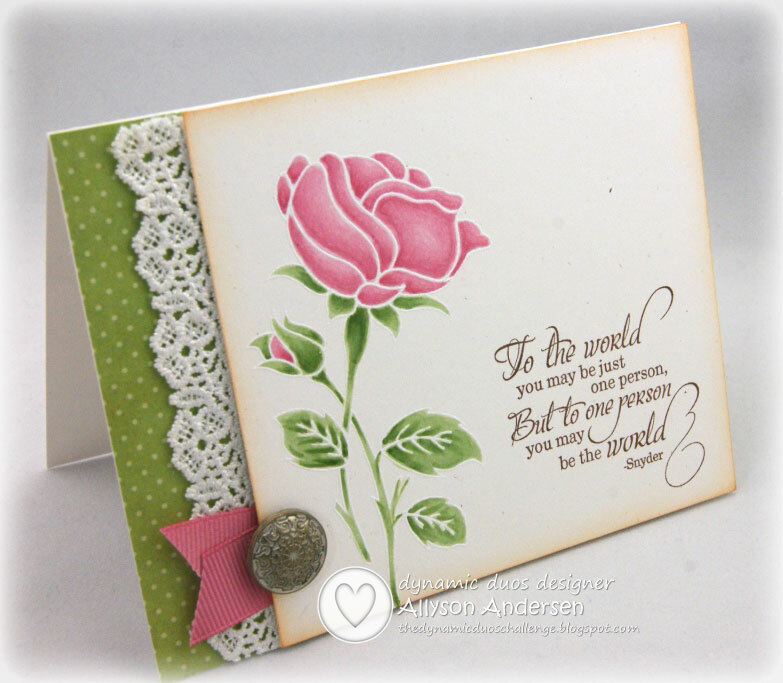 (Especially using this gorgeous image from Clearly Besotted Stamps.) Here is an example by Debby. I finally gave it a try a few weeks ago, and I think it turned out pretty well! Not perfect, but I really love the look of this, and I can see myself using it more. 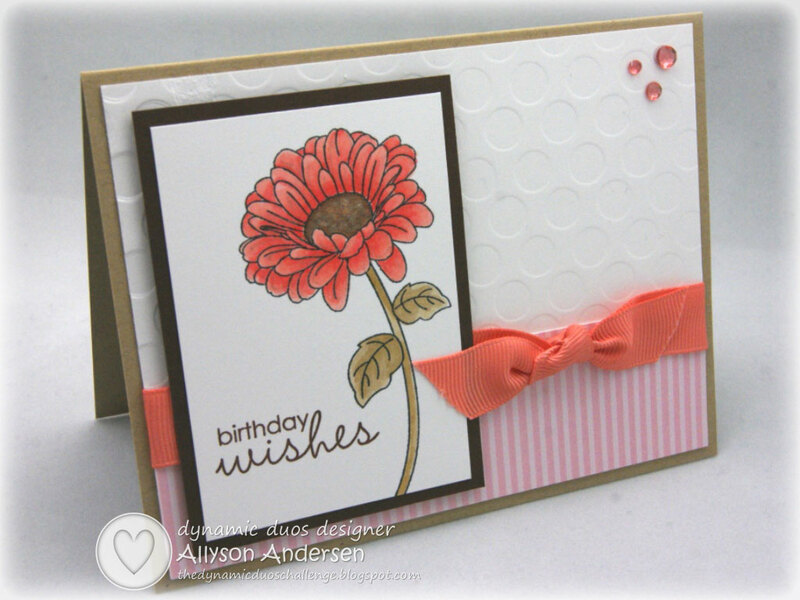 I used some miscellaneous green polka-dotted DP with my favorite lace, a Stampin’ Up! brad, and a snip of Autumn Rose ribbon for embellishment. Make sure you stop in to see what the rest of the Design Team have created and to check out the details for this challenge. 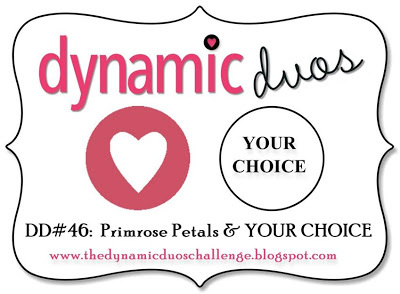 I can’t wait to see what color you’ll choose to go with Primrose Petals and to see what you’ll create with them! 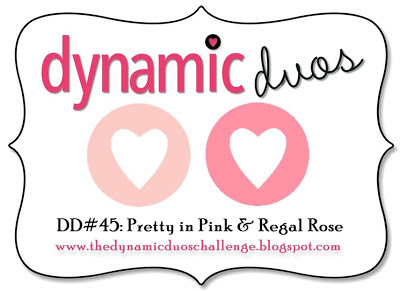 Today’s Dynamic Duos combo is Pretty In Pink and Regal Rose. I substituted with some close matches and added a bit of neutral brown and beige, as well. Actually, I think it looks a bit gold here. I went with PTI’s Fine Linen color because I wanted a neutral for the leaves that was a little on the green side but not green enough to be contrary to the rules of using only the 2 designated colors. 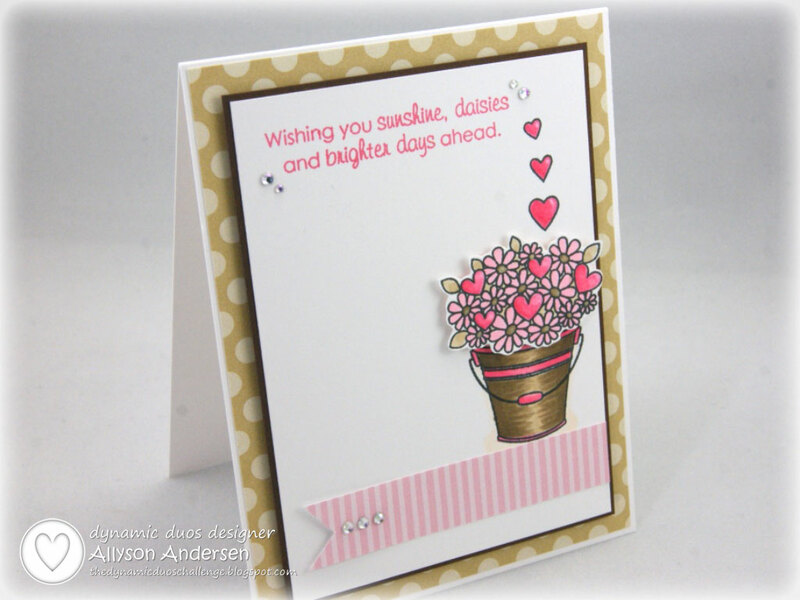 I used my new Buckets of Love stamp set for the image and sentiment. 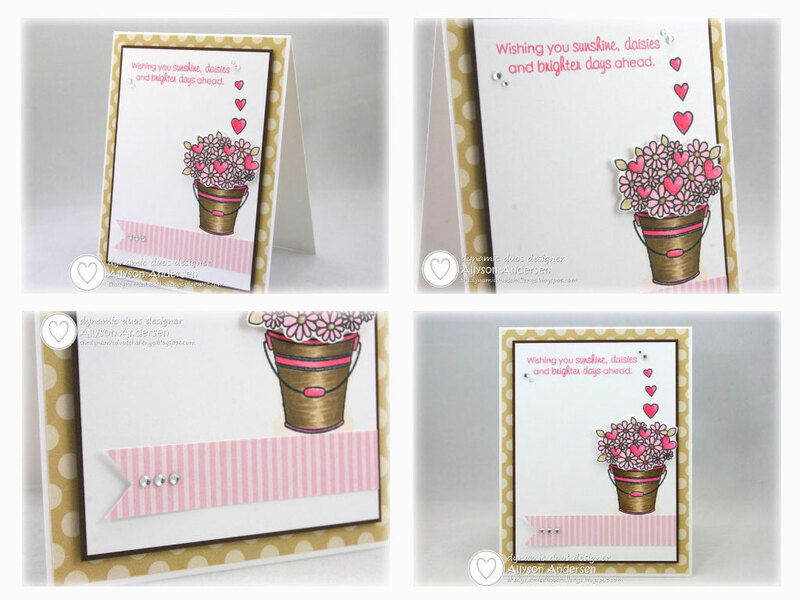 The three additional rising hearts are from the Sweet Baby and With All My Heart stamp sets. I fussy cut the bunch of flowers, dotted the flower centers with a glitter pen, and then adhered the piece with foam adhesive. Make sure you stop in to see what the rest of the Design Team have created and to check out the details for this challenge. I hope you will participate with us! 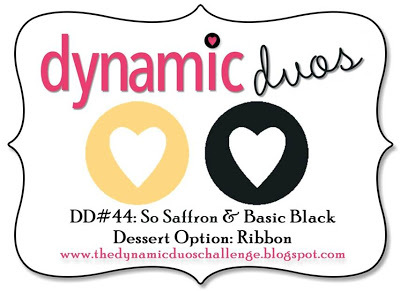 Stopping by with my creation for today’s Dynamic Duos challenge, which is for the colors So Saffron and Basic Black. There is also a Dessert Option for ribbon. It was difficult for me to see anything but ‘bumblebee’ with these colors! 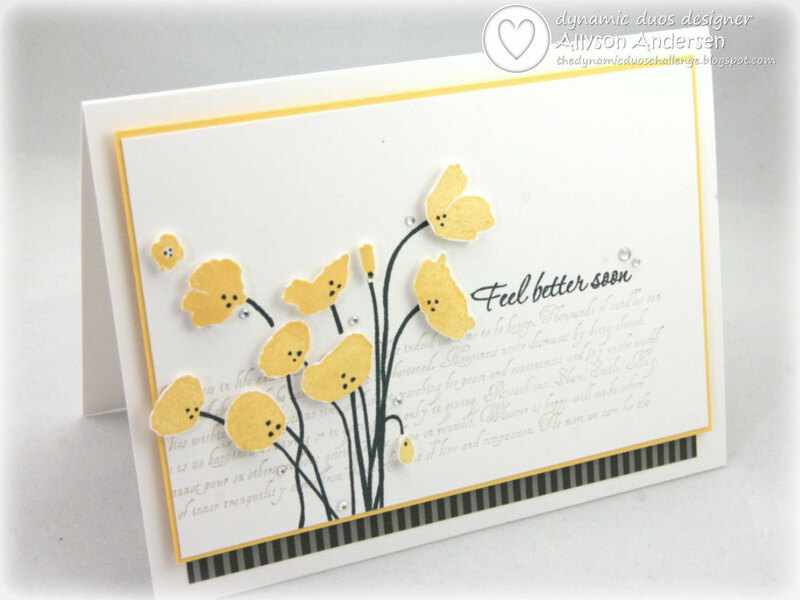 😉 But I fought that instinct and used my Botanical Silhouettes stamp set for a little get well card, instead. And I might send it to myself, because I’m going to need it next week! I fussy cut each of the blooms and attached them with foam adhesive, also adding a few little black marker dots to them (don’t look too closely – my eyes have had a hard time lately!). Then a few rhinestones here and there. That’s it for me today. I am in for a crazy week ahead, but I am hoping to see you back here next Saturday, at least, for the next Dynamic Duos challenge. 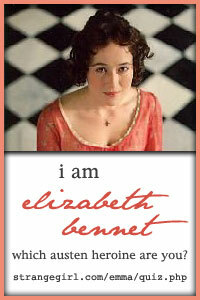 Click on the above photo for my contact info.